My library had a box sale yesterday and so we loaded up the kids, drove downtown, and took home a green tub with about 50 books. All for $10! When we got home we had to find a place for all of these books though. So I reorganized my sewing room and voila! Here is our very own personal library. I still have many books in storage and all of our fiction books (including all of the kids books) are in a separate bookshelf so what you see is just our reference books! And at the very, very bottom right corner, some scrapbooks and baby books. 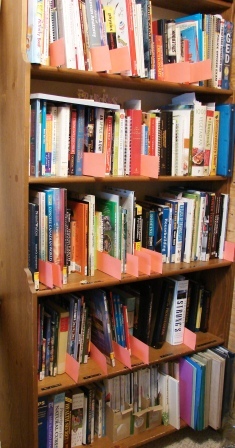 This morning I spent almost an hour creating labels and dividers for the bookshelf. It looks so good and it makes me feel so good. I have always been a book-a-holic. I love books! I love my library! 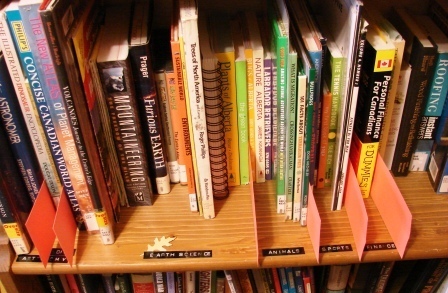 12 Responses to "Books, books, wonderful books!" Oh that’s wonderful M! I am a book lover too! What a deal 50 books for $10.00. Can’t go wrong! You are so organized! I love your book shelves. I wish my collection was organized like that! Nice work! That sounds like a great deal! I’m also a book-a-holic…and you did a wonderful job organizing all of your books. Much better than my stuffed shelves. what an amazing deal! I’m a book-aholic myself 🙂 My office is turning into a library…. Hi! I’d like to seek your permission if I can reuse one of your pictures for my next post? Specifically the second picture. As a book lover, that sounds like Christmas come early! Lovely library set up, need to set up one of those for myself!